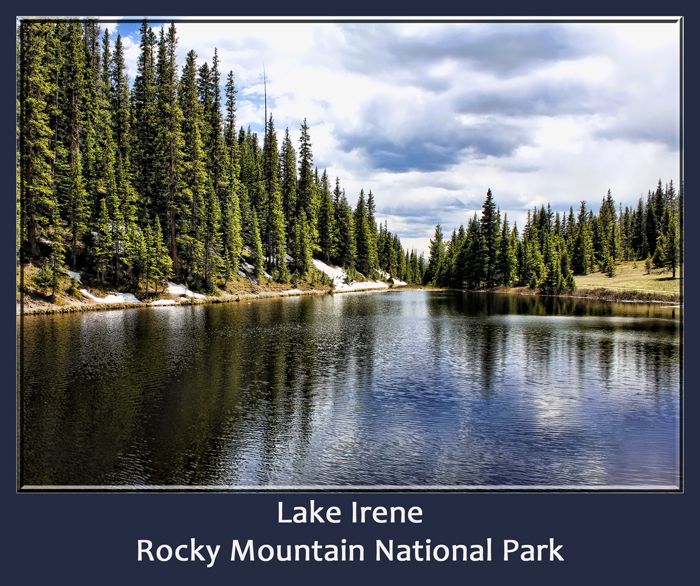 This year we explored a small lake we have never been to in the park…Lake Irene. It was actually an easy and enjoyable hike (finally a fairly flat trail)! We didn’t see a single soul and had the hiking trail and the lake to ourselves…now that was a huge treat! I want to give a shout out to Steve Rich for creating this frame action for photoshop elements. It makes it so easy to add a quick frame and gives the image a wonderful finishing touch. THANK YOU, STEVE!!!! Anybody could feel at home there. The lake seems to go on forever. I love this scene. Isn’t this a great action?? It looks just fantastic on this image Tammy. Beautiful shot of Lake Irene. Great reflection and detail and in the water. Kind of surprised to still see snow, with the low-snow year they had. Adds a nice pop of white on the water’s edge. this is gorgeous and is that snow! Beautiful and idyllic! Fantastically done! Great shot—will make a great print. This looks so peaceful. Nice shot. Girl you should totally frame this one! Beautiful!